On Wednesday American Airlines reported it had ended services with Expedia last Thursday as a result of Expedia website began discriminating against American's flights and schedules by listing them lower in the search display than those of other airlines. American Airlines said it has seen a year-over-year increase in its overall ticket sales since December 21, when it removed its schedules and airfares for American Airlines and American Eagle flights from Orbitz website and since December 23, when American removed its schedules and airfares for American Airlines and American Eagle flights from Expedia. 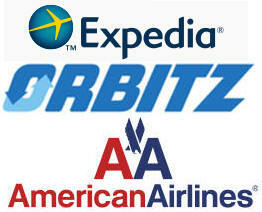 American further states that while the year-over-year increase in ticket sales is roughly comparable to that seen earlier in December, American has noted a shift in ticket sales to other channels, notably online travel agencies, such as Priceline.com, and referrals from metasearch engines, such as Kayak.com, as well as increased volume on its own website, AA.com. "Our results to date show that consumer choice is alive and well and that our customers continue to have thousands of options to purchase American's competitive fares and convenient schedules," said Derek DeCross, American's Vice President and General Sales Manager. "It is also clear to us that other online travel sites and traditional travel agencies are capitalizing on this market opportunity to gain business. Beyond that, we want to thank our customers and travel partners for their continued loyalty and support. We appreciate your business." DeCross reiterated that American is committed to working with all distribution channels, including traditional travel agencies, online travel agencies and global distribution systems, to benefit from adopting its direct connection model, powered by Farelogix, which delivers to travel agencies and their customers more customized travel choices and options. There is no cost to tap into American's direct connection. "Our direct connection offers a path to a new era of buying and selling travel services," DeCross added. "Traditionally, airline products have consisted of different flavors of airfares. In the future, however, we envision the world of travel evolving into a much wider variety of products and services beyond fares. "Our direct connection will help travel agencies help their own customers by giving them access to customized choices and delivering the best value to travelers. We do not envision a future in which we only sell to our customers through our own branded website. Our goal is to have broad distribution channels and choices for our customers, with our products and services delivered efficiently and without unnecessary costs flowing through the process."